When you visit our Toyota dealership in Bloomington, MN, you get to enjoy an experience that you can only get at a Walser location. We are dedicated to providing each and every customer with a positive experience that they won’t only enjoy themselves, but hopefully tell other people about, too. That’s why we’re dedicated to The Walser Way — our philosophy of how to do business and ensure customer satisfaction. There are many facets to this philosophy, but one of the key components is our Best Price First. Every single vehicle on our lot is specially marked with our pre-discounted Walser Best Price, so you don’t need to waste time attempting to haggle down an inflated value. Instead, you can focus more on finding the perfect vehicle that matches your personality and lifestyle. When you drive off our lot, you can be confident that it’s in a vehicle that you truly love. Another thing we do differently from other car dealerships is we provide one-on-one assistance throughout the entire buying or leasing process. That means that the same person who greets you at the door and takes you on your first test-drive is the same person who will walk you through your financing options and help you sign the final paperwork. This way, nothing gets lost in translation and our employees can take the time to get to know you and what’s important to you. Whether you want to drive off in a new Toyota Camry or dominate the roads from behind the wheel of a new Toyota RAV4, you will be well taken care of here. After you’ve picked out the car you love, you can bring it back to our Toyota service center any time to keep it running in peak condition. From routine oil changes, brake inspections and tire rotations to more involved maintenance like powertrain and transmission repairs, we can handle it all. Plus, we have a huge selection of genuine OEM Toyota parts, so only high-quality components are going into your vehicle. For a relationship that can last a lifetime, visit Walser Toyota today. 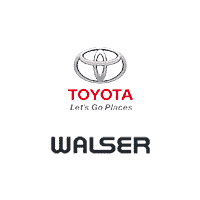 Walser Toyota is conveniently located at 4401 American Blvd, West Bloomington, MN, 55437. We’re open six days a week and are excited to pair you with your next new or new-to-you Toyota vehicle!